I have a special place in my heart for the CARROT suite of apps, since their creator, Brian Mueller, was one of the first developers to pitch me when I broke into the tech writing business. That first app, originally called CARROT, is now known as CARROT To-Do, because he’s expanded it into an entire suite, composed of CARROT To-Do, CARROT Fit, CARROT Alarm, Artificial Superintelligence (a game featuring CARROT), and even a CARROT sticker pack. The gimmick of the CARROT apps is that they’re powered by a hilariously murderous AI called CARROT, which dishes out insults while helping you reach your goals. CARROT is inspired by GLaDOS from Valve’s “Portal” series of games, but while Valve has seemingly given up on game development, CARROT is very much still alive. Well, in the AI sense, anyway. The latest app in the CARROT suite is the $4.99 CARROT Weather, and it’s not only my favorite app in the suite, it’s also my favorite weather app period. Bradley Chambers of the Sweet Setup concurs, naming it the best weather app for iPhone and iPad. CARROT Weather is optimized for the iPhone, iPad, and Apple Watch. 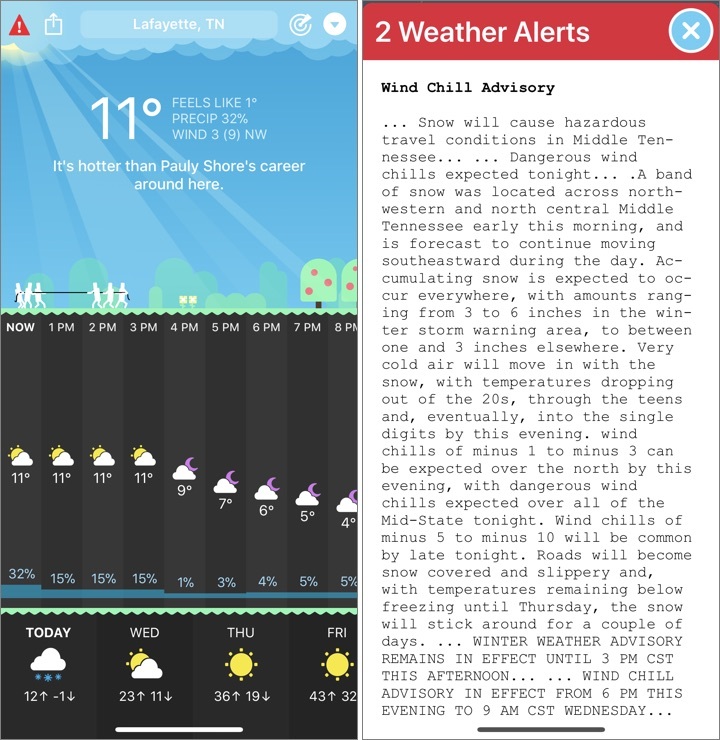 When you open CARROT Weather, it gives you an hourly forecast in an attractive format, along with a daily forecast on the bottom of the screen. By default, CARROT Weather gets its weather predictions from Dark Sky, which is pretty accurate (Adam Engst is a fan, see “Dark Sky 5 Offers Hyperlocal Weather Forecasts for iOS,” 7 August 2015). I love that I can open the app and see the entire day’s weather at a glance. CARROT Weather displays a warning icon on the main screen if there are any weather alerts in your area — tap the icon to see full details. Alas, the National Weather Service writes the alerts, not CARROT. There’s also usually a little illustration of white stick figures doing something. I don’t know what it means, if anything. When it’s raining or snowing, a graph of precipitation over the next hour replaces the figures. Full weather radar (United States only). 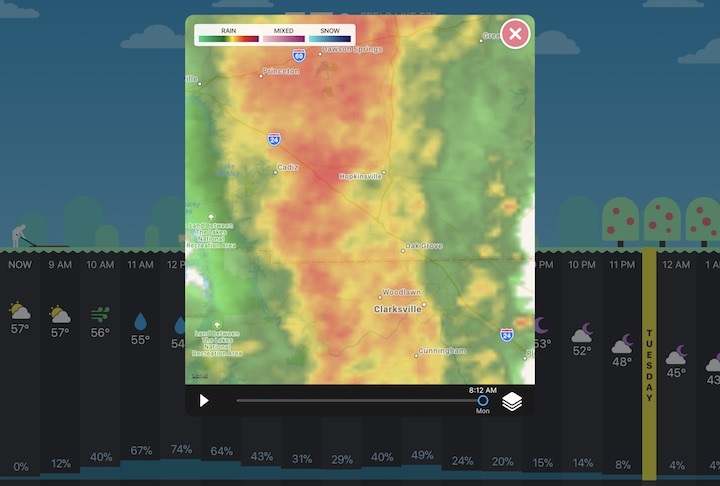 It lets you scroll backward in time to see the path of precipitation, but not forward to see where it’s predicted to go. An Apple Watch app that actually works. The complication is reliable and the app loads instantly! To date, it’s the only third-party complication or app I use regularly. My personal favorite, an AR mode that brings CARROT into the semi-real world. Whatever you do, don’t poke or look directly in her ocular sensors! Professional, if you don’t care for CARROT’s banter. This disables CARROT’s personality. For all settings other than Professional, you can also alter CARROT’s politics to centrist, liberal, conservative, or none. I’m not sure what the differences between the three political settings are — feel free to experiment. I think the Premium Club membership is worth it just for the notifications, which I’ve found to be reliable. Better yet, unlike every other weather app I’ve tried, they don’t drain my battery! In fact, when I check my battery usage in Settings > Battery, CARROT has used only 2 percent of my battery over the past 24 hours, and it doesn’t even show up in the 7-day battery usage list. For $1.49 per month or $9.99 per year, you can join the Ultrapremium Club, which unlocks Weather Underground as a source. In my experience, Dark Sky is pretty good, but Weather Underground is just a bit better. I’ve used both, but neither is entirely accurate. For example, it was snowing the other day while CARROT Weather showed clear skies with Weather Underground’s data. But I learned from @NashSevereWx on Twitter that flurries were happening under the radar, so at that point, I was butting up to the limits of modern meteorology. For less anecdotal accuracy comparisons, check out ForecastAdvisor. 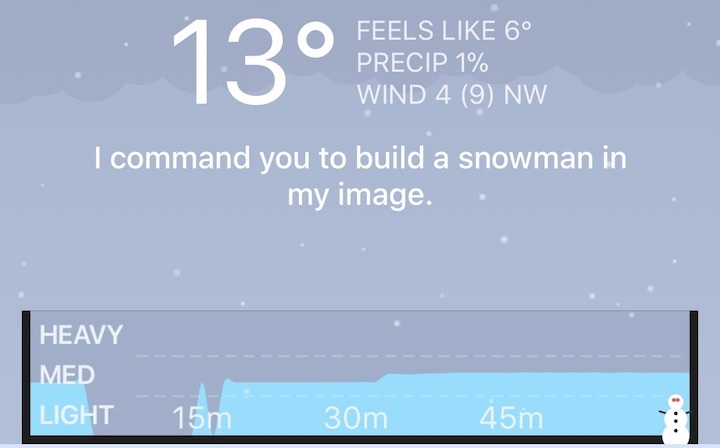 If you’ve been left unsatisfied by other weather apps, CARROT Weather will do a good job for you. But be glad she’s just an app. Absolutely my favorite weather app on any platform. It's a joy to use for an otherwise mundane daily activity. The "Missions" are fun, too! It's obvious: the stick figures are enjoying the nice weather with a game of "Tug-of-War"!